Natuzzi is known for their relentless commitment to quality and sophisticated Italian design. Natuzzi Sofa Beds are built with European webbing and plush mattresses, making them some of the most desirable sleep solutions on the market. Our selection of Natuzzi Quick-Ship Sleeper Sofas are in stock and ready to ship within approximately 10-20 days from the time of purchase. Italians are known for a number of things. Pizza, spaghetti, romance, the Colosseum and… beautiful furniture design! Our selection of Natuzzi Quick-Ship Sofa Beds feature a wide range of transitional models, upholstered in 100 percent top-grain leather hides. 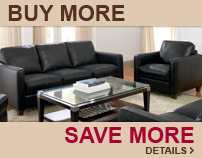 Natuzzi Sleeper Sofas offer exceptional quality at an unbelievable value. Constructed using solid wood frames and industrial strength webbing, Natuzzi Leather Sleepers are sure to provide years of comfort and support for you and your guests. Many Natuzzi Sofa Beds contain Greenplus Foam Mattresses. These innovative and ecologically sound mattresses provide great support while conforming to the contours of your body.